The first twenty I ran this year, a couple of weeks ago, was what I call a P : it’s basically an in-and-out with a loop at the end. It had one pretty bad hill, but it was at about the half-way point, so not too bad. 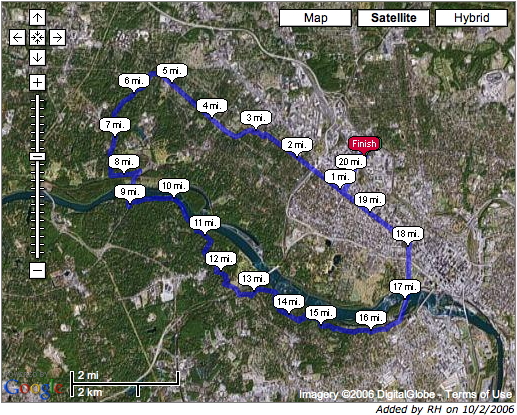 Today’s run, on the other hand, was a large loop (about a mile was retracing our steps, but that’s not uncommon). the back third of the run was along Riverside Drive, which is known to us runners here in Richmond as being a torturous series of hills. Put that from mile nine to mile 16 and you’ve got yourself a punishing run. I had some bad calf cramps in my right leg a couple of weeks ago and really did a lot of stretching througout today’s run. I was able to stave off the cramps, but both calves were mooing badly with soreness for the last five or six miles. Speaking of that portion of the run, we passed over the Lee Bridge to cross back over the James. Now, I’ve been hearing complain about that bridge (which is nearly a mile long) for the past couple of years and I never understood why. I mean, I love bridges and enjoy getting look at Richmond’s biggest and newest in the downtown area. There are great views of the city skyline from there, as well as Hollywood rapids, the cemetary, and Belle Isle. Today, there was also a cold headwind in my face that made running a 12 minute mile seem impossible. I know understand why so many runners here really hate that bridge. I guess I’ll just have to look forward to warm, breezy days when going over it in the future. My run took me three hours and 36 minutes, which isn’t too bad considering how much my legs were hurting towards the end. There’s a point at which you begin to see the light at the end of the tunnel, so to speak, and that always helps me to pick up at the end. I was able to change into some pants, a dry t-shirt, and my running jacket at the end, but I’ve still been chilled to the bones since ending the run. That’s why I’m currently in my fleece jacket, under a down comforter, and typing with Angela’s very toasty iBook on my lap. Angela’s sitting here with me, also helping to warm me up a bit. I think I’ll get a cup of coffee in a bit and see about just letting my legs rest for a while. Here’s hoping that the Marine Corps Marathon (three weeks from today) sees some better weather. At least our vacation in Alaska this week will help prepare me in the event it isn’t. I saw some of Mom’s photos (hopefully I can convince her to put them on Flickr soon). Love the shirt you made for the race. It sounded like a really fun race and both you and Stephanie did really well. I’m proud of the both you you, too. My training’s been going pretty well this year, although I’ve not been as hard-nosed about running everyday like I was last year. Angela’s been having hamstring problems and is seeing a PT now. She’ll be able to run/walk the marathon, but it’ll be tough for her to catch back up on the training schedule at this point. You and Steph really should could consider coming up here for Thanksgiving. We’re all going to run the Turkey Trot over at UofR again and it’ll be lots of fun.